We are beginning to see with a sinking heart that the University of Glasgow would perhaps not pass their own entrance exams when it comes to vocabulary relating to safer cycling. While they are clearly running a tight press campaign on their plans for University Avenue, and undertaking a great deal of copying and pasting within their communications, they do appear to have a rather poor grasp of the meaning of certain words. That, or perhaps they are being deliberately disingenuously mendacious. So over at GoBike we have brought our dictionaries out and hope to help. Painted cycle lanes will remain as they are on only one side (the uphill sections) of the road, where they will then disappear. There will be no physical protection provided from traffic for people cycling, Recent research has shown that painted lanes encourage dangerous close passes. The lanes will not be widened. The current painted lanes are 1.5m (the bare minimum outlined in the subscribed design guide Cycling by Design – the desired width suggested is 2m) and new plans will merely retain this 1.5m minimum. The lanes currently have double yellow lines (meaning no stopping) and will now have a mandatory status white line added for the cycle lane (meaning no driving). There will be no discernible change effected in the stopping legislation by making the lanes mandatory. The advisory painted lanes on University Avenue have always had double yellow line status which we have proven to be ineffective against illegal parking. If it has been too difficult to enforce no parking, it will be even more difficult to enforce no driving. Making the lanes mandatory will formalise the painted lane status but will have no effect on the illegal parking that causes danger to people cycling on University Avenue. People on bikes will be forced at the top of the hill into the stream of traffic at a pinch point where the lanes disappear. People cycling descending the hill will be forced onto the carriageway to mix with traffic. Now, let’s take a minute to consider some of the UofG’s communications which include this video, their campus redevelopment updates and some quotes from their more recent emails. Safer – The condition of being protected from or unlikely to cause danger, risk, or injury. All – Used to refer to the whole quantity or extent of a particular group or thing. Safer….? As in more safe than now? Protected? And for everyone….? Reeeeeally everyone…. are you sure? Upgrading -Raise (something) to a higher standard, in particular improve (equipment or machinery) by adding or replacing components. As outlined in our points above, nothing in these plans show a higher standard or improvement planned for the current, frankly dangerous, cycling space on University Avenue. This university representative doesn’t go on to say how the cycle lanes are being upgraded, but elsewhere, such as here, the claim is made that the lanes will be widened! Segregation – The action or state of setting someone or something apart from others. “The Transport Assessment was one of the supporting reports submitted as part of the Planning Permission in Principle in 2016. Section 4.6 of the TA states that the proposed cycle measures for University Avenue “will aim to provide clear routes of access to, through and around Gilmorehill Campus such as clearer segregation on University Avenue, clearer wayfinding…”. The definition being referred to in this case is Glasgow City Council’s Strategic Plan for Cycling 2016-2025, which makes no distinction between the differing types of segregation, but uses this as a terminology. Hierarchy – An arrangement or classification of things according to relative importance or inclusiveness. …this bit doesn’t even make sense! … sorry, what? How is widening footpaths reducing conflict for pedestrians and cyclists? The cycle lanes are on the road. Is this a desperate attempt to show that the plans are doing something positive for cycling? It doesn’t even make any sense! Surely UofG are not advocating that University Avenue is so dangerous to cycle on that people should cycle on the pavement? Are they?! And what about the conflict on the road…between cyclists and faster moving heavy large vehicles? Disingenuous – not candid or sincere, typically by pretending that one knows less about something than one really does. Mendacious – not telling the truth; lying. “Please agree and outline who is responsible for the retrofitting measures mentioned that you have been using to pacify people writing in with concerns about University Avenue. UofG are now referring to retrofitting, suggesting it will only happen “should this be something the council wish to revisit”. On the other hand, GCC have stated that “The University already has Section 56 approval for the works and any additional features that they agree to retrofit will be proposed by the University and not by Glasgow City Council. GoBike would require to approach the University regarding consultation on measures”. 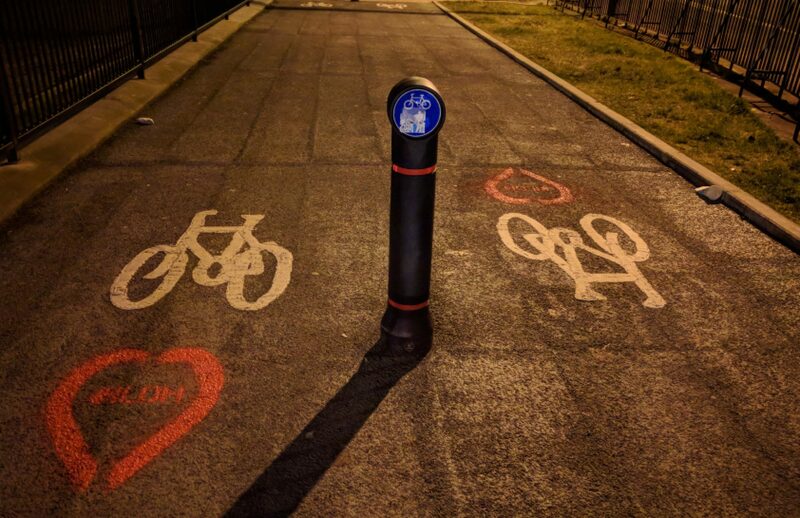 GCC had also stated that “the University is currently exploring the option to introduce light segregation which would afford protection to cyclists from vehicles, but this will initially be on a trial basis to ensure there will be no detrimental impact on pedestrian safety i.e. represent a trip hazard.” So which is it? Is it the case that there have already been discussions and a decision regarding retrofitting that has not included us? We call for the University of Glasgow to stop claiming what is not true in their press and advertising. Conditions will NOT be safer for people cycling on the street, conditions have NOT been improved for people cycling, and the safety of everyone has NOT been taken into account.